These are in my top five favorite meals. The shrimp is marinated in the lime citrus marinade then grilled and chopped. The taste is incredible especially when it's served with the cilantro lime rice and shrimp taco sauce all in a fresh tortilla! Pour the citrus lime marinade into a large plastic bag. Rinse shrimp and remove the tails. Set on several paper towels to dry. Dry well. Add to the bag with the marinade. Evenly coat the shrimp. Marinate 15 minutes at room temperature or up to four hours in the refrigerator. It is important to rinse and dry meat. The rinse cleans it of any residue. Drying it helps the marinade stick to it, giving it maximum flavor and tenderness. 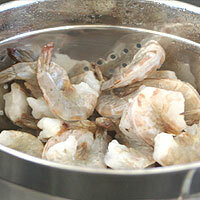 The marinade is very acidic and will break the shrimp down if it marinates too long. Heat grill to high. Heat 5-10 minutes. 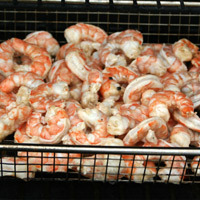 Place the grill basket on the grill a few minutes before adding the shrimp. Add shrimp and spread evenly. Keep heat on high and cover with the lid. Shrimp cooks very fast so don't leave it unattended for long. Stir after 3-4 minutes, then every minute or so until it's pink. When shrimp turns pink it is done all the way through. 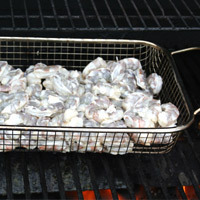 For best flavor the grill basket should be hot when you add the shrimp. The basket pictured is a Pampered Chef product. I love it! Food doesn't fall through it like it it does in many grill baskets. Remove from grill and let sit 5-10 minutes. Chop into fairly small pieces. Place in serving dish. Cook or heat the tortillas. I like the uncooked tortillas that can be purchased at most grocery stores. I have made tortillas myself and they were not worth the work. I don't recommend using corn tortillas in this recipe. The corn taste overpowers the taste of the shrimp. Fill the rice, shrimp and shrimp sauce. Enjoy! Grilled shrimp- grilling is a must for the this recipe. I tried broiling them once and the flavor was very dull. 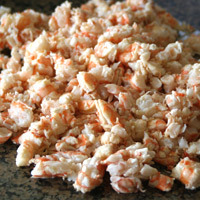 Chopping the shrimp- for best flavor, chop the shrimp. 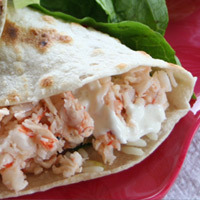 The shrimp tastes great whole, but in the taco the flavor is better if the shrimp is chopped. 1. Make the marinade. Cut limes and squeeze juice into a food processor or cup of an immersion blender. Pick out any seeds. With the machine running, add the olive oil in a slow steady stream. Process until completely and emulsified, about 15 seconds. Add salt and blend a few seconds more. 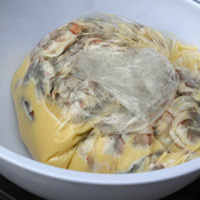 Pour marinade into a large plastic bag. 2. Rinse shrimp and remove the tails. Set on several paper towels to (1)dry. Dry well. Add to the bag with the marinade. Evenly coat the shrimp. Marinate 15 minutes at room temperature or up to (2) four hours in the refrigerator. 3. Heat grill to high. Heat 5-10 minutes. Place the (3)grill basket on the grill a few minutes before adding the shrimp. Add shrimp and spread evenly. Keep heat on high and cover with the lid. Shrimp cooks very fast so don't leave it unattended for long. Stir after 3-4 minutes, then every minute or so until it's pink. When shrimp turns pink it is done all the way through. Remove from grill and let sit 5-10 minutes. Chop into fairly small pieces. Place in serving dish. 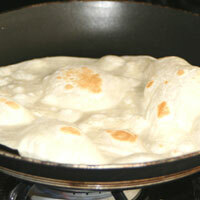 (4)Cook or heat the tortillas. Fill with the rice, shrimp and shrimp sauce. Enjoy! 1. Measure rice and set aside. In a separate container, measure water and salt and set aside. Melt butter over medium/high heat. Add rice and cook a minute or so stirring frequently so it doesnâ€™t burn. Turn the heat to high and add water and salt. Bring to a boil. Cover and reduce heat to (1)low. Cook 15 minutes. Turn heat off but keep it on the burner and let sit 15 minutes. Do not remove the lid! It needs the steam to finish cooking. 2. While the rice is cooking, seed and core the jalepeno. Crush through a garlic press. Chop the stems off the cilantro. Finely chop the tops. (2)Squeeze and measure the lime juice. 3. When rice is done, fluff with a fork. Add jalepeno, cilantro, lime, green chiles (undrained), and salt. Mix well and serve hot. Because of the fresh lime and cilantro, it's best used the same day, but leftovers are still pretty good. Mix all and refrigerate until ready to use. 1. It is important to rinse and dry meat. The rinse cleans it of any residue. Drying it helps the marinade stick to it, giving it maximum flavor and tenderness. 2. 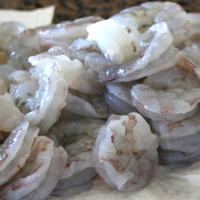 The marinade is very acidic and will break the shrimp down if it marinates too long. 3. 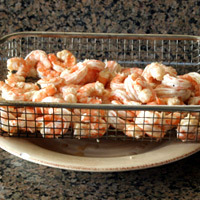 For best flavor the grill basket should be hot when you add the shrimp. The basket pictured is a Pampered Chef product. I love it! 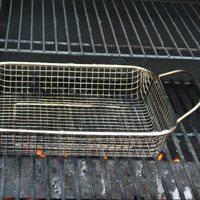 Food doesn't fall through it like it it does in many grill baskets. 4. I like the uncooked tortillas that can be purchased at most grocery stores. I have made tortillas myself and they were not worth the work. 1. It is very important to use parboiled rice. Long grain rice gets starchy when mixed and you'll end up with a clumpy mess. Parboiled rice also keeps longer and can be reheated and still maintain it's texture. 2. On my stove I have low, 1-8, and high. To cook the rice, I put it on 2. 3. place it in the microwave 5-10 seconds at a time. When buying limes make sure you can squeeze them fairly easily. Firm limes don't give much juice.